Blueprint brings you the best of the rest of the pavilions from the 2015 Milan Expo. It must be galling for Russia that just beside and in front of its dramatic ski-jump canopy cantilevering 30m out from the entrance, the wooden pavilion of tiny Baltic republic Estonia sits solidly with a parallel upward canopy. 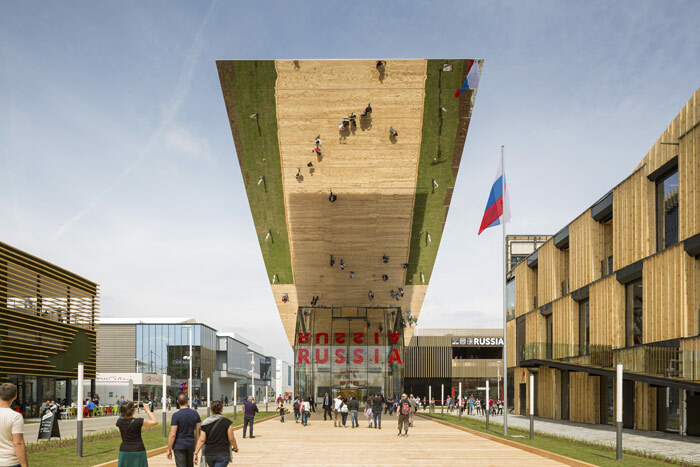 Russia's Expo website is fronted with a rendering of its pavilion that doesn't just airbrush the Estonians out, but views it from empty space actually occupied by the Estonians. The Russian pavilion is a striking design that in itself rises way above such issues. The highlight is that curving canopy. It is mirrored with stainless steel, reflecting the generous boardwalk and people on it with the clarity of Foster's Vieux Port mirror (2013) in Marseilles, but with more height and an echo of the heroic reach-for-the-stars thrust of Kolchin and Barshch's Conquerors of Space Monument (1964) in Moscow. The mirror continues arcing down across the glass-sided reception, which is big enough for a modest-sized orchestra to play in. Your correspondent witnessed Levin Anatoly conduct students of the Tchaikovsky Conservatory College. They should have played outside, where I stood, but it was raining. That canopy came in handy, and the performance was wonderful. Beyond the reception, exhibition rooms show info about Russia and its food in panels and projections. There are fun elements -- a bar surrounds a big sci-fi chemistry set of pipes and steam-punk tanks, and cookery demonstrations are held in a giant open-book-shaped shelter. Further afield, a cafe has a wide art-deco seating bay, modelled on the Trans Siberian Express. The L-shaped upper floor is clad with vertical wooden ribs, and plant and plants share the roof. The Russia Pavilion, designed by SPEECH's Sergei Tchoban with Alexey Ilyin and Marina Kuznetskaya, is strongly contemporary. But Tchoban, co-designer of Moscow's Federation Towers, knows he follows in the footsteps of great constructivists such as Konstantin Melnikov and Boris Iofan, who gave Soviet pavilions a 'clear silhouette, a strongly accented entrance... and a minimum of meticulously designed expressive elements'. Tchoban has delivered all these, and a Russian triumph.